Desiree Linden became the first American woman to win the Boston Marathon in 33 years earlier this year. She ran that 26.2-mile race in 2 hours, 39 minutes, and 54 seconds. She’s competing in the New York Marathon on Sunday, fueled by pasta, peanut butter, and lots of coffee. Desiree Linden drank champagne from her running shoe after she won the Boston Marathon in April. „It’s a lot of years of really hard work paying off,“ Linden told Business Insider. She’s now preparing to compete in the New York City Marathon on Sunday, fueled by lots of caffeine, carbohydrates, and a strict sleep routine. When she’s running, Linden said her simple mantra is „calm, calm, calm,“ since she believes you can’t force your way into a successful run. „You have to let the fast come out of you,“ she said. In the New York Marathon, Linden will be competing against her friend and colleague Shalene Flanigan, who won the race last year. That triumph broke an even longer US women’s losing streak — no American woman had taken the trophy in New York City since 1977. Linden said both wins were the result of years of hard work and dedication. To train for the New York Marathon, Linden said she supplemented her runs with more strength training. She ramped up cross-training and added more planks and push-ups into her routine than she did when she was younger. „I’m 35 so maybe less miles is better,“ she said. She also tries to protect her body from injury when she runs, though she admits she doesn’t have any special secrets for avoiding crossing over the „red line“ and overtraining. „Marathon training is all about learning how to run well when you’re really tired,“ she said. The element of Linden’s daily routine that’s non-negotiable is her main fuel: coffee. She’s been a coffee drinker far longer than she’s been a professional athlete; her love of the brew goes back to her grade school days, when she used to sip Folgers while watching soap operas with her sister. „I started young, with a very low bar, and a small budget,“ she said. Her coffee tastes have matured since then. Linden and her triathlete husband Ryan now have their own small-batch coffee line, called Linden and True, which they started with another athlete couple, Ben and Sarah True. Caffeine is one of the most common and effective (legal) performance-boosters athletes use, and studies suggest it’s also great for the long-term health of your heart. It’s not practical to take coffee out on the race course, so instead Linden mixes caffeine performance gels into some of her water bottles. Despite the consistent caffeine jolts, Linden tries to keep to a strict 10 p.m. curfew to help repair her muscles and recover from 16-mile-long training runs. Getting enough sleep helps maintain the cells in the body that fight off tumor and virus cells, as well as keep blood-sugar levels stable. There’s even some evidence that ample sleep can make people less likely to have heart attacks or develop some deadly cancers. But after race day is over, Linden ditches her strict routine for at least a couple of weeks. She likes to indulge in a hamburger with some cheese and jalapenos (scientists think full-fat cheese may help protect the heart and keep cholesterol in check), and maybe a beer. Then the athlete reassesses her goals, asking herself whether she really wants to keep running, and if so, what her next challenge should be. 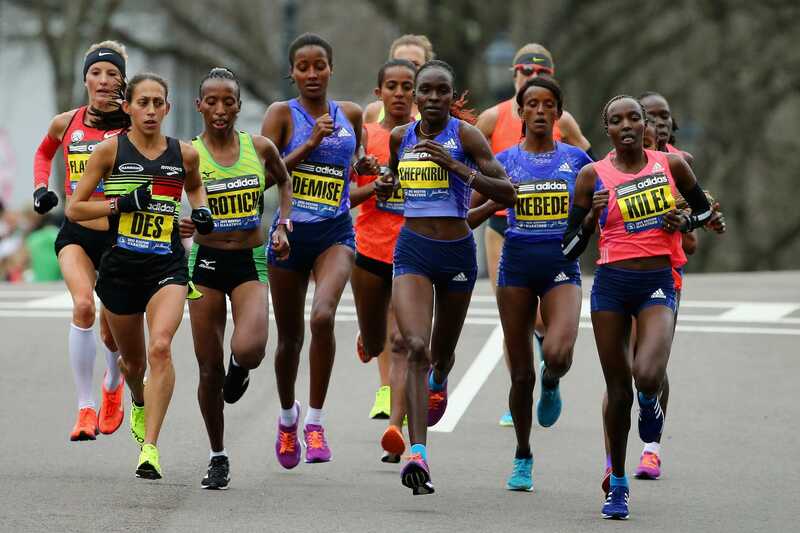 In New York, she’s heading into the marathon weekend acknowledging that winning in Boston may have been a once-in-a-lifetime success. Whether or not she breaks the ribbon on Sunday, Linden believes that anyone who wants to can run a marathon. She encourages skeptics to just try logging a few miles. „No one’s ever finished that and said ‚wow, I wish I hadn’t gone for a run today,'“ she said. The runner’s high is even greater, she said, after a 26.2-mile marathon.